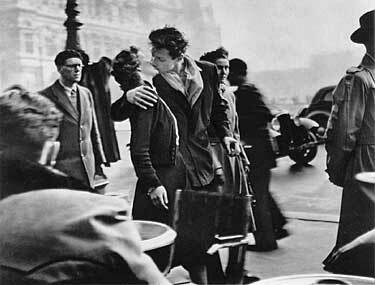 The vin­tage photo of the day is Side­long Glance by French‚photographer‚Robert Dois­neau and was taken in 1948. Dois­neau is one of France’s most famous pho­tog­ra­phers and many of his images like Kiss by the Hotel de Ville are con­sid­ered iconic. What makes this pho­to­graph so appeal­ing is the sense of story and sense of humour. 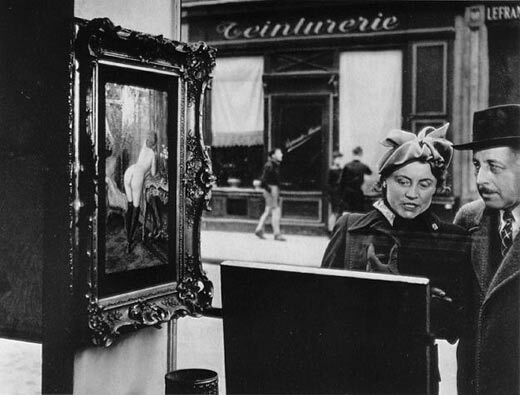 The woman is look­ing at the art in the‚foreground painting‚but the man sees ‘art’ in a dif­fer­ent paint­ing off to the side. The model’s bare bot­tom in the paint­ing is the bright­est ele­ment in the image so our eye (as well as the man’s rov­ing eye) goes right to it. The point of view of the image, the fab­u­lous tim­ing, as well as the fact that the sub­jects seem unaware that they are being pho­tographed all add to this image’s appeal.